Marine biologists from the University of Plymouth are to work with counterparts in Cyprus on a project seeking to stem a lionfish invasion in the Mediterranean Sea. The venomous fish has been identified as the most ecologically harmful species to be invading southern European waters, and is responsible for significant impacts on biodiversity due to its predatory behaviour and rapid reproduction. Working with the University of Cyprus, Plymouth scientists will be helping to coordinate a number of different activities, including the development and implementation of an early surveillance and detection system, and a removal response strategy. Working with the University of Cyprus, Plymouth scientists will be helping to coordinate the development and implementation of an early surveillance and detection system, and a removal response strategy. The four-year project, RELIONMED – funded by €1,676,077 from the European Union’s LIFE programme – follows on from research conducted last year, which showed that the lionfish had colonised the south eastern coast of Cyprus in just one year, moving in from the Red Sea via the Suez Canal. 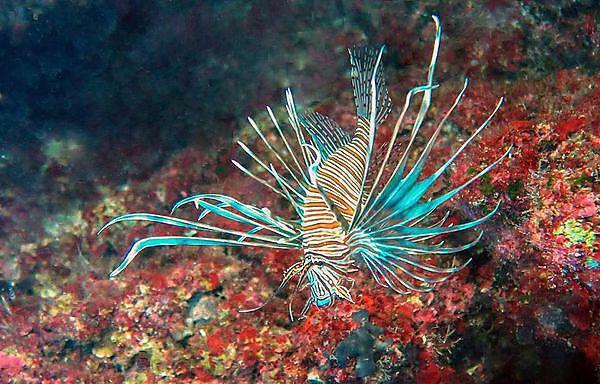 Lionfish are generalist carnivores and can feed on a variety of fish and crustaceans. They spawn every four days, year-round, producing around two million buoyant gelatinous eggs per year, which can ride the ocean currents and cover large distances for about a month before they settle. The University of Plymouth will receive €186,800 for its role in the project, which will include further assessment of the risks associated with lionfish, the development of a handbook on detecting and removing lionfish, and the transfer of skills and knowledge to neighbouring countries.